It’s normal for toddlers and very young children to go through periods of faddy eating. But what if it carries on and children are still picky about food when they’re approaching their teens? For most parents, the main concern is whether their child is getting enough nutrients to keep them healthy and help them grow. 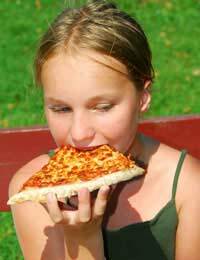 Bear in mind that children’s appetites vary and will fluctuate as they experience growth spurts. If a child is full of energy and growing normally, they are probably OK. It can be reassuring to look at a child’s daily intake of food and note down what they’re actually eating each day. Check that they’re not filling up on unhealthy snacks. Make sure that the only snacks in the house are nutritious ones – like fruit, whole grain bread, cereals and crackers, dried fruit and raw vegetables. Healthy snacks between meals are fine, particularly for children with small appetites. Watch what they drink. Too many sugary drinks fill children up so they have no room left for food and are bad for their teeth. Although pre-teens are increasingly influenced by their peers and other social factors, what goes on at home is still very significant. Make sure the whole family understands the importance of eating well and aim for a good balance of carbohydrates, proteins, fats, vitamins, minerals and fibre every day. Let children help with choosing menus, shopping, cooking and preparing food. They may be more inclined to eat if they feel involved. Although it’s important to address picky eating and help children develop better eating habits, try not to make food into a big deal. For example, if the adults in the household are constantly counting calories or worrying about their body shape, children will pick up on it. Likewise, using food as rewards or bribes just makes it into more of an issue. Even if healthy choices are on offer at school, children may not choose to eat them. This is probably one to relax about – if children eat healthily at home, one less nutritious meal is not a disaster. Alternatively, send them in with a healthy packed lunch from home. It can be very frustrating having a faddy eater in the house. But on the whole, children grow out of it – and if a good example is set at home, they’ll tend to adopt a similar approach as they become adults themselves. In some cases however, a child may not be taking in enough calories. If they habitually refuse to eat, become secretive about eating, disappear after meals to the bathroom or start losing weight, it could be a sign of a developing eating disorder. Always raise such concerns with a GP or health visitor to avoid things getting out of hand.